Blog shine brightly, speak kindly and live thankfully. shine brightly, speak kindly and live thankfully. Truly blessed are words that spring to mind when I reflect on the past month. 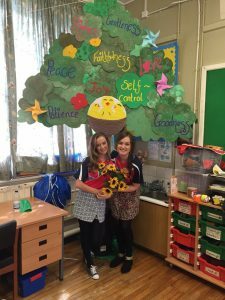 To pick up on last months blog I had one camp completed already in Castlewellen and had just began my week down in the beautiful Glencull where I was a member of the Fáilte team. 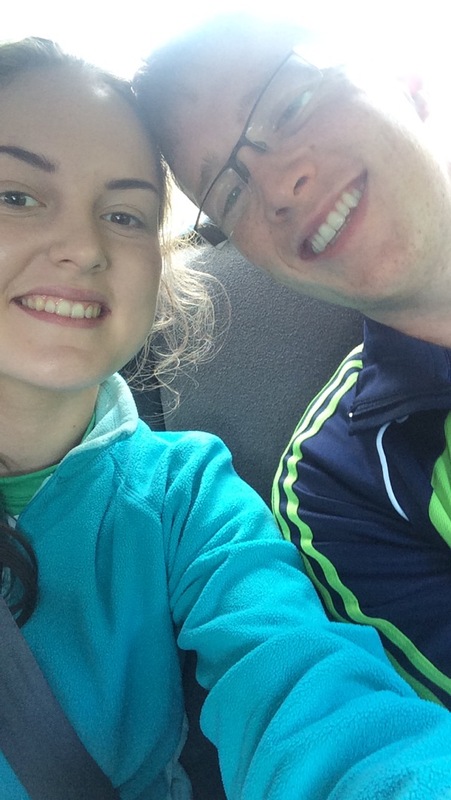 I am so lucky to be able to spend a week up in Tyrone with those who first created and carried out the programmes that have now spread out to 15 camps throughout the country. It was a very special week in Glencull, as they had now came full circle, returning to Cycle A, and it was certainly a much more relaxed week this time around I’m sure! The miserable weather certainly didn’t dampen our spirits as the fun and laughter filled St Malachy’s Glencull from the second we got there. If we weren’t organising a surprise flashmob, we were jiving, or else singing our rendition of Taylor Swift’s “Shake It Off”…. it was a very creative week! It was then back to my roots, back to where my MF Camp journey began three years ago, the very special County Down Camp in Newry. Since missing last years camp I have worked with so many different people throughout the country so I was itching to get back to work with the fantastic team I have at home! I was back in the faith room, to deliver the Cycle C programme. 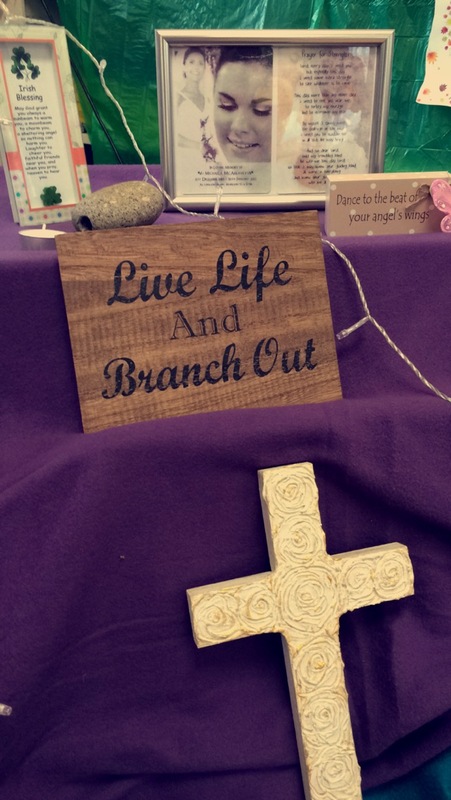 Everything we did this week was based around the tree, having planted our seed of faith in Cycle A, journeyed and watered it in Cycle B in our boat and now in Cycle C we are rooted in our faith and ready to branch out and grow into the world. For a few of the girls it was their third and last year of the camp and from the first ice breaker on Monday morning, the emotions were high as their last week as a campette quickly unfolded. 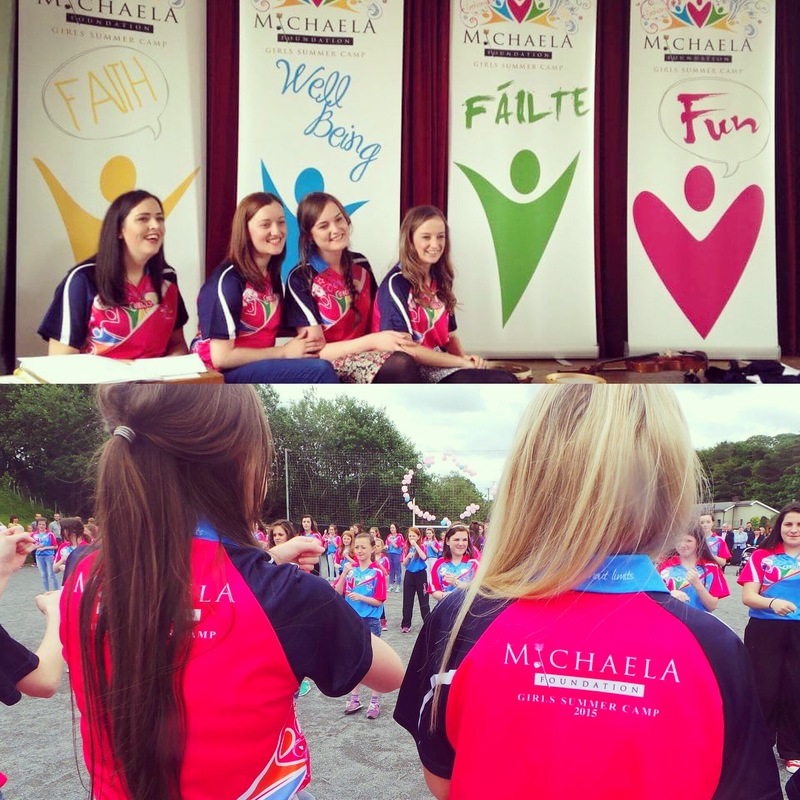 This particular group of girls were so special, and a credit to the amazing work of the Michaela Foundation. Their last element session on Thursday was in Faith, so we decided to have an extra special session for them where we all sat in a circle around a photograph of Michaela and a candle. This little sacred space represented Michaela being the heart, and bright light of both the Michaela Foundation and our camp journey. Everything we said from that point on was offered up as a prayer, and the words the girls shared with us were so special. They shared with us how the camps have allowed them to meet people just like them, grow in confidence, and learn that faith is a beautiful thing. Something very similar to the affects my Michaela Foundation journey has had on me, surely no coincidence! That very special hour will be one of my favourite camp moments. It was a powerful week, and a truly special way to finish my three weeks of camp! 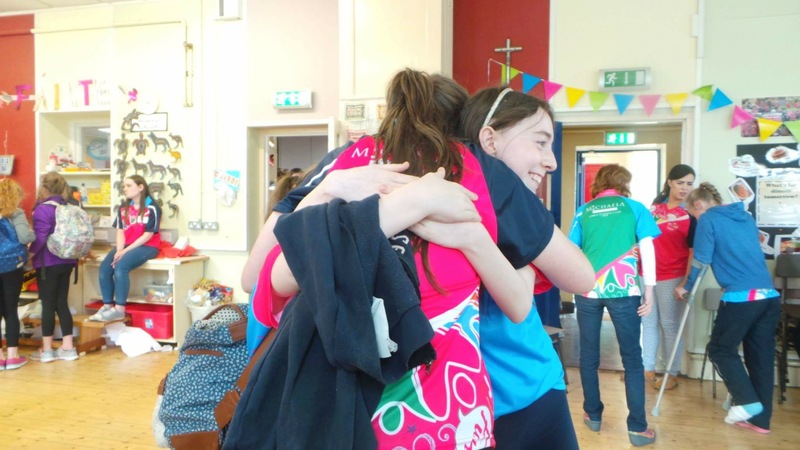 I’ve been a leader at seven camps now across Down, Armagh and Tyrone over the past three years and with every week they just get better, and I learn so much from not only my fellow leaders but from the lovely little campettes too. Their innocence, and view of the world is just so special, and they continue to inspire me year after year. During their time at camp all we ask of the girls is to have an open heart and know that a smile is the most beautiful thing we can wear. Kindness is a melody everyone can sing along to! 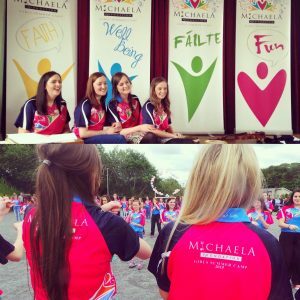 I can only hope that the girls will carry Michaela with them in their hearts, alongside all the wonderful leaders that have worked to inspire each and every one of them through the life of Michaela. To wrap up my 2015 camp season I decided to pack up and make my first trip to Lough Derg! I really didn’t know what I was letting myself in for, but off I went anyway alongside my cousins Micheál, Bernie and her friend Mary. After such a busy few months with camp prep and then the camps themselves, I haven’t had a minute to stop and take in everything that has been happening, so Lough Derg was just what I needed. I really made the most of taking a step outside our busy world and a step closer to God. The past few weeks, months and year have been so blessed, so I was very much there in thanksgiving. It was a very challenging three days, but unbelievably rewarding! I was in such great company too, which made it all the better; my cousin Micheál is 22 and this was his 4th trip (I’ve some catching up to do)! However, as rewarding as it was, nothing felt better than finally getting to put your shoes back on, it actually beat the midnight feast… who would’ve thought?! It’s the little things! So back to the mainland, body and soul challenged and now filled, I can do nothing but encourage everyone who has ever thought of it or not, to give it a go. You certainly wont regret it! A truly special place right on our doorstep. I’ll be back on the road again now very soon as I take to the hills! The beautiful Donegal awaits for a well-needed break with family and friends. Let’s hope some of that Donegal sunshine graces us while we’re there!